Gov. Bill Walker reaffirmed Wednesday that he plans to remain in the governor's race, a day after his former lieutenant governor and running mate Byron Mallott resigned over unspecified "inappropriate comments" he made to a woman. Mallott's resignation on Tuesday came just three weeks before the Nov. 6 general election. Walker losing his running mate adds a new wrinkle in a crowded race for governor. Walker, an independent, is running against former U.S. Sen. Mark Begich, a Democrat, and former state Sen. Mike Dunleavy, a Republican. Libertarian Billy Toien is also on the ballot. In a brief interview Wednesday, Walker said he was not spending a lot of time at the moment thinking about how he would win in the three-way governor's race. 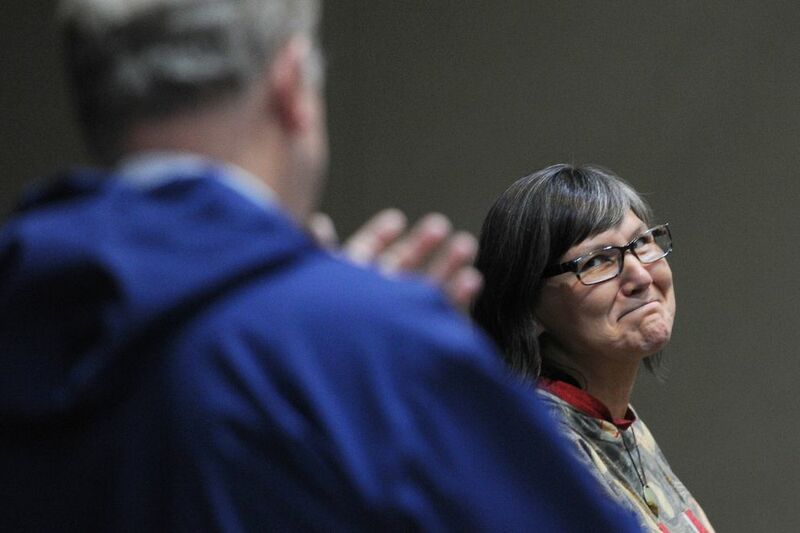 "We have a lot of stuff happening — the transition, AFN. I'm busy being governor right now," Walker said. 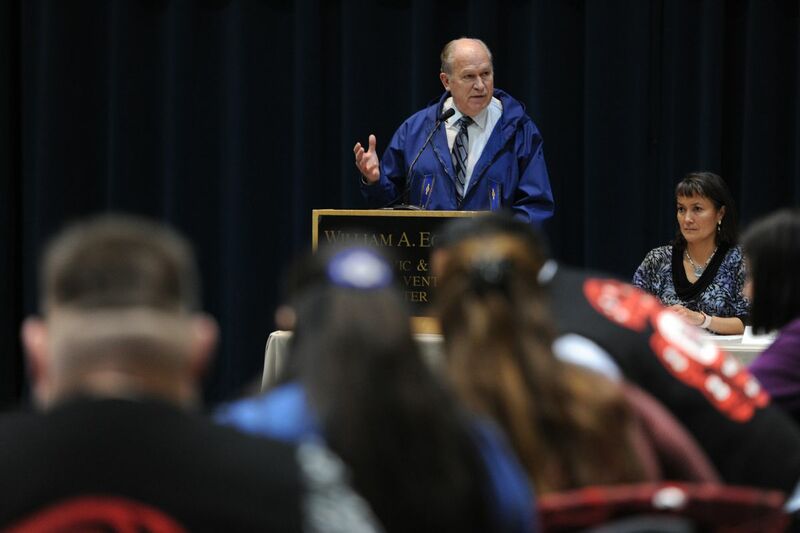 Walker talked to reporters at the Egan Center in downtown Anchorage on Wednesday before speaking at the annual tribal conference organized by the Alaska Federation of Natives and the National Congress of American Indians. Asked by a reporter if he was planning on staying in the race, Walker said: "I am." Valerie Nurr'araaluk Davidson, the new lieutenant governor, also spoke at the conference. Mallott had originally been scheduled to speak. "While I'm really honored to step into the role of lieutenant governor, this is not really a situation that any of us could have predicted and, I'll just be honest, yesterday was a really tough day for all of us," Davidson said during the conference. "But today is a new day and today is an opportunity to move forward, to work together, to continue to heal the past so we can move forward in strength and together, and that's what we do as Native people and we will continue to do that today," she said. Davidson was sworn in as lieutenant governor Tuesday. She had served as commissioner of the Alaska Department of Health and Social Services up until then. She will also serve as Walker's new running mate in the upcoming election, though the Nov. 6 ballots have already been printed with Mallott's name on them. Walker declined Wednesday to further describe the comments made by Mallott that triggered his resignation. Walker had called them "inappropriate overtures" a day earlier. He would not specify Wednesday what that meant. Walker said he didn't know whether Mallott's comments qualified as sexual harassment. That's a legal determination he said he couldn't make. He said he also couldn't speak to whether the woman considered the comments as sexual harassment. He referred to the woman as a victim. "I don't know, as governor, whether or not technically it's sexual harassment," Walker said. "We're just not going to elaborate much further on what we've said," Walker said. "Really trying to be respectful of the individual involved, the victim that, has requested that, you know, we be very careful. Everything we've said, we've — I've run past her." Grace Jang, Walker's deputy chief of staff, said, "There was a conversation that took place. It was perceived one way by one party. The lieutenant governor took full responsibly for the actions and he resigned." Walker's campaign manager, John-Henry Heckendorn, on Tuesday told the Anchorage Daily News that the governor and Begich had been engaged in conversations for the past several days "about a path forward" that doesn't result in Dunleavy being governor. There are concerns among some Democrats about Begich and Walker splitting the vote, handing the governorship to Dunleavy. But Walker said Wednesday that he and Begich "rarely speak." "It's not a regular thing," he added later. "Occasionally we do."